The Office of Chemical Safety offers several chemical safety courses. Some are online while others are face-to-face. Please explore the course listings below for more information and follow the instructions to register. This in-person course teaches you how to work safely in the laboratory with hazardous materials in accordance with the OSHA Lab Standard. The course is available to all lab employees. Format: In-person; register online through OHRD. For groups of 15 or more, schedule in-person training by contacting Nils Gibson. This course provides information about chemistry and chemicals for non-laboratory personnel. This course is intended for housing, dining, custodial and other facilities staff. Anyone though is welcome to take this online course; please encourage anyone who wants to learn more about chemicals to explore this course. This course is comprised of four modules. Fundamentals of Chemicals covers chemistry basics such as matter, atoms, pH, solubility, etc. In Acids and Bases we discuss what the pH scale means and the hazards associated with corrosive chemicals. Flammable Liquids covers flash point and how to safely work with flammables, and Toxic Substances covers different classifications of toxins, short-term and long-term exposure to chemicals, and specific toxins including lead and asbestos. Format: Open enrollment is available at https://canvas.wisc.edu/enroll/A3H6R8. This course covers how to safely work with cryogens such as liquid nitrogen. The course is divided into two sections. In the first section, we discuss the general hazards posed by cryogens, first aid for cryogenic burns, oxygen depletion hazards and how to transport cryogens. Everyone who works with cryogens should complete part 1. In the second section, we discuss how cryogens are stored, risks of pressure explosions and the hazards of non-inert cryogens. Part 2 should be completed by researchers who are responsible for the maintenance of cryogenic Dewars and cylinders and those who work with non-inert cryogens such as liquid oxygen. In this online course you will learn how to dispose solvents, dry chemicals, lab trash and other materials such as chemotherapy waste, EPA-regulated chemicals and sharps. You will also learn how to request and prepare for a chemical pickup and how to order items from our chemical redistribution service. Fume hood in-person training covers safe use of a fume hood, introduction to the components of a fume hood, alarms and warning, and repair and maintenance contact info. This training is available for all UW-Madison employees who use a fume hood or have one in their work area. Format: For groups of 10 or more. Schedule in-person training by contacting Todd Yanke Todd.Yanke@wisc.edu . Fume hood online training covers safe use of a fume hood, introduction to the components of a fume hood, alarms and warning, and repair and maintenance contact info. This training is available for all UW-Madison employees who use a fume hood or have one in their work area. This in-person course teaches you how to properly prepare chemical shipments and how to load and unload chemical shipments. All employees that perform shipping must be trained on how to identify, mark/label and package hazardous chemicals, as well as security and emergency response information. Our HazMat Shipping & Transportation page provides additional information on regulations. This in-person class teaches you how to work safely with hazardous materials in a non-lab environment. All departments on UW-Madison campus that work with or use hazardous chemicals in a non-laboratory environment (such as art studios, printing operations, custodial operations, etc.) must implement a Hazard Communication Program as per the Hazard Communication Standard, CFR 1910,1200 and Globally Harmonized System of Classification and Labeling of Chemicals. This course covers the Globally Harmonized System of Classification and Labeling of Chemicals (GHS). You will learn about GHS pictograms and hazard classes and how to read chemical labels and safety data sheets. This course should be taken by anyone who works with chemicals. Format: Open enrollment is available at https://canvas.wisc.edu/enroll/JJHL3D. The Personal Protective Equipment (PPE) training is a basic guide to common laboratory PPE and their uses. This training will cover general recommendations for appropriate PPE, where to find lab procedure specific PPE requirements, when PPE should and should not be used, and knowing the different types of PPE and the hazards they protect against. Since this is not a complete guide to all PPE used on hazards in your specific laboratory this training will help guide you to resources to make the right decision of your particular laboratory hazards. After this training; you will have a better understanding of how to choose and use PPE, where to go to get information if you are unsure about PPE, and what hazards PPE will and will not protect against. 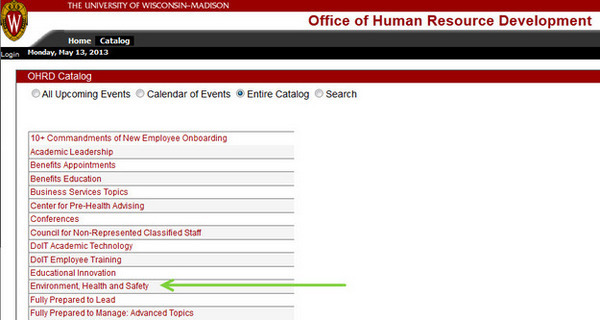 This training will is available for all UW-Madison employees. Format: Open enrollment for this online course is available at https://canvas.wisc.edu/enroll/33HHHJ. Training for the online courses may be obtained using the VCRGE Look Up Tool. Please Note: Your record may not be visible in the Look Up Tool for up to 10 days after you have completed the course. This data transfer delay is beyond the control of the Chemical Safety Office. Please contact the Chemical Safety Office for questions or to request additional training resources. 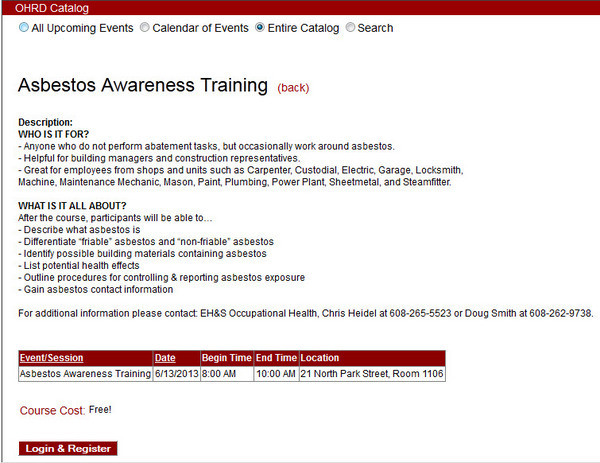 Register for onsite training using the OHRD registration system. 1. Click on Environment, Health & Safety in the catalog. 2. Choose a class from the available listing. 3. After selecting the course, the description dialog will appear. This screen provides course name and basic information about the course. Press the “Login & Register” button. 4. Select an Authorization Type and continue to register for the course.